JERUSALEM (AP) — An Israeli opposition lawmaker on Sunday called on Prime Minister Benjamin Netanyahu to dismiss his ambassador to the United States for failing to report sexual assault allegations against a top Netanyahu aide, ballooning an already embarrassing scandal for the Israeli leader. Karin Elharrar of the centrist Yesh Atid party said Ron Dermer should be recalled from Washington for not reporting the warnings he received about David Keyes, Netanyahu’s spokesman to foreign media. She also lashed out at Netanyahu himself for staying mum on an issue that has engulfed his close associates. At least a dozen other women have since come forward with varying allegations, some of which are said to have been committed since Keyes took up his current position in early 2016. Keyes, 34, denies the allegations, saying all “are deeply misleading and many of them are categorically false.” Keyes says he has taken a leave of absence amid the uproar to try and clear his name. 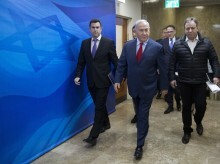 But the scandal has since spread to the rest of Netanyahu’s inner circle, which has previously been rocked with accusations of sexual improprieties. Natan Eshel, a former top aide, was forced to resign in 2012 after allegations emerged that he harassed and intimidated a woman in the prime minister’s office, including taking pictures up her skirt. Earlier this year, Netanyahu’s son Yair came under fire after a recording emerged of him joyriding at taxpayer expense to Tel Aviv strip clubs and making misogynistic comments about strippers, waitresses and other women. Netanyahu’s office did not immediately respond to a request for comment. Media reports in recent days have included the testimonies of various women detailing what they called aggression on the part of Keyes, where in some cases he coerced them into sexual acts. The New York Times reported that in addition to Stephens’ move, some organizations Keyes worked for himself took measures to keep him away from interns because of his history of unwanted advances. Rozin, who formerly headed Israel’s umbrella organization for victims of sexual violence before elected to parliament, has appealed to Israel’s Civil Service Commissioner asking for the allegations against Keyes to be investigated because of the “serious concern of serial behavior.” She demanded Dermer’s conduct be examined as well. It’s not the first case the #MeToo phenomenon has erupted in Israeli public life. Last year, shortly after the allegations against Harvey Weinstein rocked Hollywood and sparked a flurry of allegations in other American industries, a senior Israeli TV journalist revealed on air that Israeli media mogul and International Olympic Committee member Alex Gilady had made an “indecent” proposal to her during a job interview 25 years ago. A well-known columnist then added that Gilady exposed himself to her during a 1999 business meeting at his home and two other women later came forward saying Gilady had raped them. When veteran Israeli media personality Gabi Gazit addressed the allegations dismissively on his daily radio show, it prompted Dana Weiss — another prominent local TV journalist — to accuse him of just such behavior. Weiss said Gazit had randomly kissed her on the mouth during chance encounters in TV studios. Gazit denied the accusations but three other women come forward with similar stories and he was forced to take leave from his show.